Back in Arkansas our projects continue. The very first time I visited Arkansas a fire was involved. At that point in my life, fires were something to be avoided at all costs, something scary and dangerous, the only fires I saw growing up were in fire places. 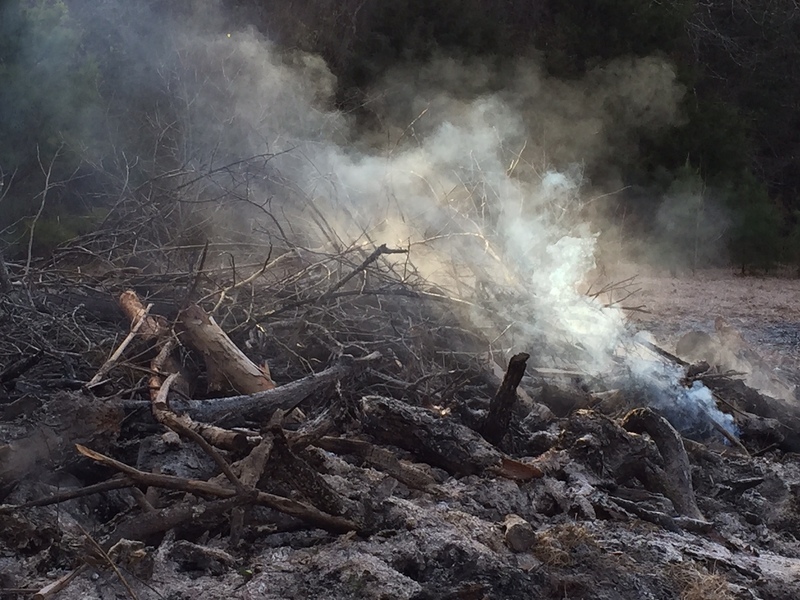 So at the age of twenty five when my soon to be husband took me to met his grandparents in Arkansas I was not sure what to think when “burning the brush pile” was on the agenda of our visit. Coincidentally, this first fire took place behind Addie’s, my husband’s family gathered together to clear out the damage done by folks who had been renting the sweet old house and then set it all ablaze in the back yard. Is this good for the environment? No. Is this how they do it in the country? Yes. Is it exciting? YES! We made a burn line so the fire was unable to jump into the forest and we manned different parts of the fire armed with shovels, our faces covered with masks or bandanas, ready to smother any fire that looked uncontrolled. I thought the whole thing was wonderful, the purposeful work, everyone coming together to help, the efficiency of the fire. I didn’t think years later we’d replicate almost an identical scenario with our own little family but that’s exactly how it happened. Over a decade passed since that first fire and in the meantime, Addie’s house was ignored, brush grew and took over what once was a meadow and fruit orchard. From time to time a family member would drop by and attempt to control the overgrowth, cutting brush and piling back in that same spot in the back yard, over the years the pile grew and grew. When my husband and I decided it was time to tackle this pile it was mammoth. We called in some help, waited for the right conditions, grabbed a little diesel and a lighter and got started. The kids categorize this day as “the best day ever”. They covered themselves in soot, helped light fires, fanned flames, smothered errant flames, burned the bottom of their boots, smiling and sweating all the way. They felt powerful and helpful and they were! It was the type of experience we hoped our kids would gain in Arkansas and they are ready for more.